Free Extra Chain (61PMM3 55) with purchase of Stihl MS 180 C-BE Chainsaw! A $20.99 BME-SRP value. Similar to the Stihl MS 180 C-B, the Stihl MS 180 C-BE Chainsaw features the Easy2Start™ system, making this chainsaw virtually effortless to start. Perfect for cutting firewood or felling trees to 12 inches in diameter, it is a lightweight practical chainsaw with convenient features you can rely on. 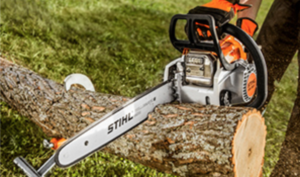 Check out all the current Stihl Specials here. Note: STIHL recommends #3610 (61 PMM3 55) OILOMATIC® saw chain and 16″ 3005 008 3913 STIHL ROLLOMATIC® Ematic™ guide bar combination. The actual listed guide bar length can vary from the effective cutting length based on which powerhead it is installed on. This entry was posted on Thursday, September 6th, 2018 at 1:45 pm	and is filed under News & Updates, Specials. You can follow any responses to this entry through the RSS 2.0 feed. Both comments and pings are currently closed.